The Nissan S30 (sold in Japan as the Nissan Fairlady Z and in other markets as the Datsun 240Z, then later as the 260Z and 280Z) was the first generation of Z GT two-seat coupe, produced by Nissan Motors, Ltd. of Japan from 1969 to 1978. It was designed by a team led by Mr. Yoshihiko Matsuo, the head of Nissan's Sports Car Styling Studio. 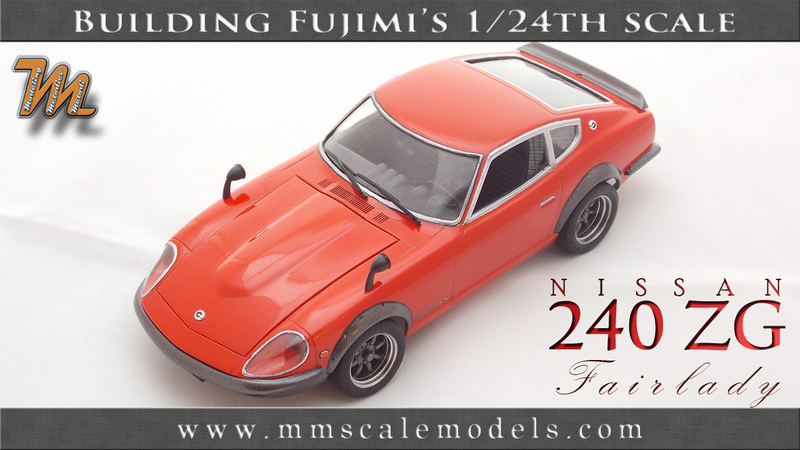 The Japan-only HS30-H Nissan Fairlady ZG was released in Japan in October 1971 to homologate the 240Z for Group 4 racing. Differences between the Fairlady ZG and an export market Datsun 240Z include an extended fiberglass ‘aero-dyna’ nose, wider over-fenders riveted to the body, a rear spoiler, acrylic glass headlight covers and fender-mounted rear-view mirrors. The Fairlady ZG was available in three colours: Grande Prix Red, Grande Prix White and Grande Prix Maroon. The "G" in Fairlady ZG stands for "Grande." Although the ZG was not sold in the USA and was never sold outside Japan, in order for it to be eligible for competition in the U.S., Nissan sold the nose kit as a dealer's option which is known as the "G-nose". With the nose added, these 240Zs are often referred to as 240ZGs, outside of Japan. I started building this scale model with the intention to put some additional detail in it. Since I didn't find any aftermarket it was obvious that it'll be all from scratch. To make a start I cut the hood from the body of the car. It was a simple task and was executed with my PE saws. Fujimi did not intend the model do be posed with the hood in opened position.Therefore it is understandable why there was only very basic internal structure underneath.Using different sizes of sheet plastic, beams and Milliput and using photos I recreated the internal structure of the front end. I also created new strut towers but they are just for the looks as struts will be mounted in the original mounting points. Other thing that I did was to extend the fender liners in a way that they actually reach the fenders and so not leave a huge gap. Further more I cut a hole in between the turn indicators, under the front bumper to accommodate my scratch built grille. Next it was time to start building the engine. It is nicely detailed despite being designed never to be seen. The head cover was on the chromed sprue so first I removed the chrome coat. I assembled the engine and started detailing it up. It had the starter motor molded in the right side. It was not very impressive so I removed it and filled the gap with putty. With the engine and gearbox ready it was time to create some bits. Being a scale model things are not exactly as their prototypes but they are good enough. I made new starter motor with bendix, distributor with cables and a bracket, hoses to and from the radiator. At later stage I added fuel lines, alternator, and various hoses. Next I moved to detailing the engine bay of the scale model. From various materials and leftover parts form other scale model builds I created miscellaneous items. Battery, brake servo, clutch pump, air ducts, ignition coil, in line fuel filter, windshield washer tank and engine bay light were built from scratch. It was time to throw some paint on them. I started with airbrushing the engine with aluminium. Then I added a drop of burnt iron in the aluminium and painted the gearbox. Next i painted the head cover with satin black and left it to cure. All was washed with dark wash. When it was ready, with sharpened toothpick, i scratched the black paint from the raised details to uncover the aluminium. That way I now I have nice looking alu. letters on the black head cover. Everything else was brush painted, highlights and shades were added as well. The radiator was painted black first then dry-brushed with aluminium. I painted the engine bay red and installed everything except for the engine which is one of the last things to install prior finishing the scale model. After that I made and attached brake lines from copper wire which I left unpainted. Various other cables and pipes were added as well. Next was time to paint the body and the under-body red. That happened in few light coats with paint leveling polish in-between. The under-body has the driveshaft and differential molded in. I masked around them and sprayed flat black followed by drybrush with steel buffable metalizer. I added fuel lines to and from the fuel tank. The complete under-body was washed with dark wash. Fender liners and fuel tank were painted with satin black. The suspension struts were molded together with the brake rotors and calipers. Due to the fact that they are not that much visible I just detail painted them and they were ready for install. When I was happy with the pain on the body it was sealed with a gloss coal which was again flattened with polishing cloth. Rims were painted gloss black then Alclad chrome for Lexan. As some areas were to be painted with burnt iron there was some masking to be done. The over-fenders, front skirt, rear end, front and rear bumpers as well as the rims spokes were painted after masking. After this painting stage was complete it was time for some more masking. This time windows frames headlight, brake-light and indicator trim needed to get some chrome on. I masked them and again after a coat of gloss black Alclad chrome for Lexan was applied.There were some blemishes and overspray that I sanded out.With fine brush and satin black I simulated the rubber sealings on the front and rear window frames as well as between the fenders and the over-fenders. I started with replicating the quilted leather upholstery seen on pictures using Milliput. Work was done by covering each panel individually. Then the resulting gaps were covered with fine sewing thread. Seats were also modified. First, using square profiles I elevated them as they were sitting too low. Then with stretched sprue i simulated piping on the upholstery. Seat belt locks and some brackets were also added. From leftover WW2 bomb in 1/72 I created a fire extinguisher and from plastic card - sun blinds. The upholstery was painted black and drybrushed with grey, then a wash was applied which resulted in sheen close to that of real leather. The dashboard, steering wheel, center console, seats and doors were highlighted with lighter shade of the base color. Decals for the instruments were applied and then were covered with drop of clear lacquer. Carpet was simulated using flocking technique with black flock and canopy glue. Ceiling lining was made out of bandage tape and was painted black. After all was painted the interior was glued together. It was time to mate the engine with the engine bay. After it was I added wires and hoses for the brake servo vacuum, ignition coil, fuel lines and heater unit. The engine bay was ready. The body was again clear coated with Gunze GX110 Superclear III well diluted with self leveling thinner. After giving it sufficient time to cure it was polished with polishing cloths of different size and automotive polishing compounds followed by wax. This scale model was one of my entries in the 2015 Scale model club Bulgaria exhibition where it was awarded II place in its category. Where I buy this scale car? Hi. Do you mean you want the kit? Or you want my buil model?